The start of the school year brings many challenges to parents and children alike. Parents wonder how their children could have outgrown the new school shoes they bought just two weeks prior; children wonder why stationery shopping is a team sport that requires the attendance of their entire family and goes for the best part of a day. While the task of frantically trying to cover books in contact paper seems like the most pressing challenge of the new school year, we'd like to encourage you to also spend some time planning out ways to keep your children healthy and active throughout the year. And don't worry: no one will judge you if that darn contact isn't completely lump-free! Here at Vuly we love to see healthy kids having fun and being physically active on their trampoline. It's important to exercise regularly, but equally important to fuel those little bodies with healthy food so that they get the best possible benefits from their trampoline bounce. So say farewell to all those holiday lollies and fizzy drinks, because a combination of healthy eating, consistent physical activity (such as a regular bounce on the trampoline), and a positive environment will help to ensure a happy, stress free and successful school year for your children. Good food is essential to the growth and development of all children. It doesn't matter how much exercise you're getting on your trampoline if you don't have the necessary nutrition to fuel your bounce! These foods are usually found in the fresh produce section of your local supermarket. With the exception of the grains found in bread and cereals, these foods generally look exactly the same as the moment they are picked, and are rich in vitamins and minerals. Dairy products, meat, poultry and fish are excellent sources of protein, and contain essential vitamins and minerals. These foods will help with muscle strength and movement, cardiovascular health and tissue development. Did you know that most of our organs and tissues are made up of protein? Vegans and vegetarians can supplement a combination of grains, seeds and nuts, and legumes to achieve adequate amounts of protein in their diet. According to government guidelines, small amounts of refined sugar, fried foods and junk food can be a part of a child's diet, but should be limited to occasional consumption. We are very lucky in Australia to have access to fresh produce throughout the year, yet we often find ourselves drawn to packaged foods because they're convenient. Though that's not always a bad thing, try to find foods that are low in sugar, don't have any weird additives that you can't pronounce and have a very small number of ingredients. Brain fog is often caused by dehydration, so it's important to remember to drink regularly throughout the day, especially if it's hot or you're playing hard outside on the trampoline. If your kids don't like water, or are so used to the sugar and flavour hit of soft-drink or juice, you can start by diluting a small amount of orange juice or flavoured hydration drink in the water and gradually decreasing it as your kids become used to plain water. Drinking water is especially important when your child is bouncing on their trampoline for long periods of time. While it's so fun they don't notice that they're exercising, they actually are – and need to replenish their liquids accordingly. Why do kids seem to wake up at dawn every day of the holidays, yet struggle to wake in time for school every other day of the year? It sure has us beat! Whole grain cereal or toast, fruit, yoghurt, eggs and baked beans are excellent choices for a healthy breakfast for the whole family. Try to allow yourself plenty of time to sit down for breakfast…somewhere in between finding the library books, removing knots from that wild hair and rushing out the door to buy something for the 'healthy morning tea' you've been told is TODAY. Good luck! There is nothing wrong with a morning and afternoon snack to maintain energy levels, as long as the snack is wholesome and nutritious. The best snacks are those prepared yourself, using fresh ingredients that children like, such as a delicious spread on corn thins, cheese on apple slices, berries with yoghurt or carrot sticks with hommous. Potato chips, sweet biscuits and chocolate are generally high in salt, fat and kilojoules, so these should be kept as occasional treats, not everyday foods. The same goes for processed muesli, breakfast, or energy bars and juices that are typically high in salt, fat or sugar. 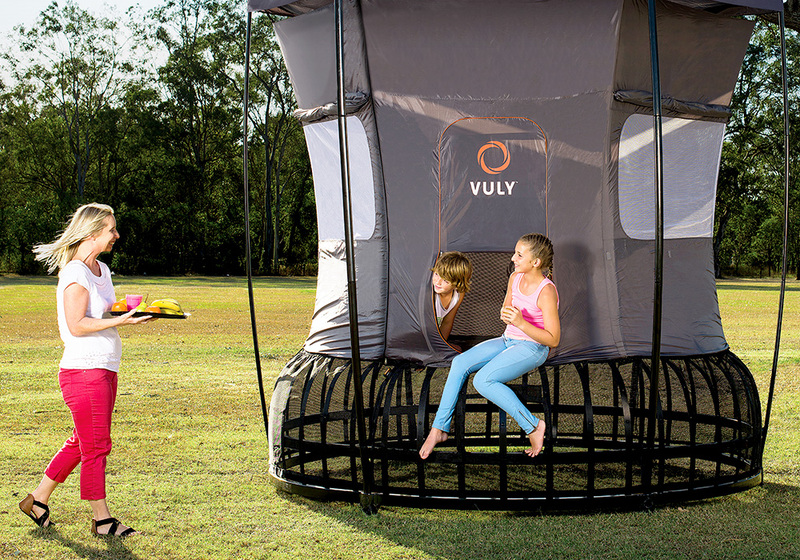 We'd like to encourage all Vuly kids to live healthy and active lives – this includes spending lots of time on their Vuly trampoline, and making healthy choices that will lead them to optimal wellbeing. *Please note this information is intended as a guide only and should not be used in lieu of consultation with a medical professional. Your individual needs may vary.